This is the first of a series of essays in Economic Strategies that bring together new ideas in business, economics, finance and strategy that have close relationships with recent developments in the sciences in which Russia excels. A theme that runs through all of them is interdependence. Some implications of interdependence are discussed; (a) between societies because of globalisation and the information revolution, (b) between finance economics and business; and interdependence as the need to take (c) a multi-disciplinary approach to theory and practice and to take (d) account of different spheres of Being, for example between the material and the spiritual worlds, between profit and ethics and social responsibility; the need to modify business policies (e) based on maximisation of the wealth of some individuals and groups at the expense of others and modify government policies (f) based purely on national advantage. There are many spheres or planes of Being (material, intellect, spirit, soul, heart....and so on) recognized by mystics and religions and as well as in spiritual approaches of writers such as Tolstoy and Dostoevsky and teachers like Gurdjieff, Ouspensky and many others and in the personal inner teachers that are open to everyone. All these spheres are reflected in the material world. Perhaps the best description of the material world (that is perceived by the senses and the intellect in dimensions of time and space) is described by Heidegger as Dasein; Being in the world. Carl Jung used the word synchronicity to describe the appearance of other spheres of Being in the (material or sensory) world (of time and space) which Heidegger called Dasein. Emanuel Swedenborg described them as correspondences. The Enneagram methodology is based on the fact that practical everyday business problems also have a spiritual dimension. Experiences of many levels of Being (soul, spirit and so on) are often dismissed as fantasy. But when physicists speak of a multiverse, and the existence of 11 or an infinite number of universes each with their distinctive physics, we must take them seriously; and what is the difference? Interpretations of religion and mysticism have become extraordinarily naive yet they point to direct and mysterious experiences that are similar to those of physics that cannot be explained by habitual thought patterns. Interdependence brings both positive and negative aspects. A positive aspect is that it is a source of creativity. Creativity in one sense is discovery, seeing and expressing possibilities that were previously unseen. In another sense creativity is the capacity to make something out of nothing. Creativity arises from the ability to express relationships between apparently unrelated things. 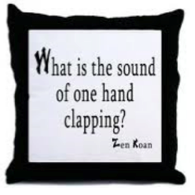 See for example the image in figure 1 and the Zen koan in figure 2; in both seemingly unrelated things are related and the mind is forced to think beyond established thought patterns. 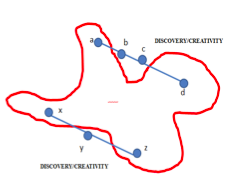 Figure 3 expresses illustrates what I mean by creativity. Think of the jagged area as a box in which neuronal patterns are fixed; relating seemingly unrelated or paradoxical things, a and d and x and z as being seemingly unrelated phenomena (the train, the time, the fireplace the mirror in figure 1) or paradox (the sound of one hand clapping in figure 2) which when they are related lead to thinking and discovery outside of habitual patterns as indicated by points b and c and y. Viruses, plagues, financial crises are negative aspects. We speak of domino effects on the entire Middle East that was triggered after the Tunisian street vendor Mohamed Bouazizi, set himself on fire alight on December 17, 2010; or of blowbacks as when arms supplied by West to Afghanistan are used against the West by the Taliban. 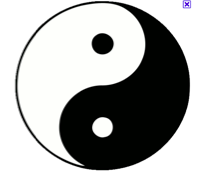 Maybe it is wiser to speak of negative and positive as being complementary rather than being opposites as in the principles of yin and yang (feminine/masculine, dark/light, right/lefty brain) in figure 4. 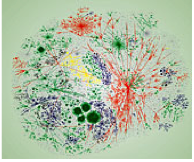 One way of illustrating interdependence is by networks. 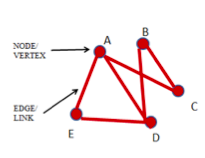 Networks consist of vertices (nodes) and edges (linkages). In a business context vertices can refer to many things depending on the problem at hand. They could be: elements in the value chain or supply chain, they could be elements of the Mckinsey 7S framework. Figure 6 represents the internet, the worldwide connection between computers. Vertices are computers: edges are connections between them. The internet has dense star formations at the centre with scattered connections around them. An important characteristic of networks is their degree distribution defined as the number of connections that a node has to other nodes or, with respect to the entire network and the average degree distribution of nodes in the network. As a person your degree would be the number of friends you have. Approximately 3% of routers are not working but most people are still able to surf the net or use e-mail servers because more than one route is available for most points. Clearly degree distribution is important for electricity grids, oil and gas supply and the railroads and airways; they need to remain operational even though inevitably, a percentage of the system has broken down. Such networks must be connected, but robust against accidents in part of the system that might cause the entire network to fail. One way that organizational, banks for example, are connected is though ownership. Many banks in the global financial system were too big to be allowed to fail. The most recent financial crisis arose because financial institutions became so large and so interlinked that they were too big to be allowed to fail. The collapse of Lehman Brothers in 2007 nearly brought about the collapse of the global financial network. Bailouts by governments of their banks had to take place to avoid a depression on the scale of the one that devastated capitalism between 1929 and 1940 and was only really halted by demand created by the Second World (Great Patriotic) War. Now the Great Recession has turned into a sovereign debt crisis. Interdependence across space is often described as synergy (or non linearity). Positive synergy refers to a situation when the firm as whole is worth more than the sum of its parts. Negative synergy refers to a situation when the value of a firm is worth less than the sum of the parts and is the reason for a firm disposing of some of its activities or outsourcing them. Economists speak of interdependence across space as externalities or synergies: If they are positive (negative) the whole has greater (smaller) value than the sum of the parts. Organizations, ranging from families, to teams, to businesses, to societies and alliances, are formed because the value of the whole exceeds the value component parts as separate, isolated entities: when this is not so, families split apart into new families, organizations break up; bits are spun off, or outsourced, in order to survive or evolve. Interdependence through time is referred to as positive feedback that takes systems upwards (virtuous circles), as exemplified by the boom/bubble period in the years leading to the financial crisis beginning in 2007: and take systems down (vicious circles), as exemplified by the Great Recession experienced from 2007 onwards in the world economy. According to the popular story, which is true to a limited extent, the crisis began in the USA and UK mortgage markets with the near bankruptcy of X and Y in the USA and Z in the UK. Crisis in mortgage markets was caused by two interdependent factors; (a) low interest rate policy of the Federal Reserve and by Central Banks in Europe enabling and (b) a house price bubble. The house price bubble increased household equity enabling people to borrow easily and the cost of borrowing was low because interest rates were low. Crisis in the mortgage sector spread like a virus because (c) because of excessive leverage by financial institutions so (the ratio between their debt and their assets was too high and this was made possible by the knowledge that governments would bailout banks if they failed – moral hazard) and (d) the ‘originate and distribute’ model encouraged banks to create excessive debt (financial innovation which means inventing more and more debt instruments). Many banks (as we explained above) were too big to fail: so governments had to bail them out (moral hazard); creating government debt either to buy the toxic assets that were, after the bubble burst, worthless, or take Banks into public ownership. As result of bailouts and the size of Banks relative to the size of the economies in which they were owned, national governments, first Iceland, followed by Greece, Ireland, Portugal and perhaps Spain had to seek bailouts which in threaten the existence of the Eurozone. The Great Recession spread through nearly all the world, causing unemployment and slower growth. The cost to the world was somewhere between $60 trillion and $120 trillion. The immensity of the cost can be seen when it recalled that the (annual) GDP of the entire world is approximately $60 trillion. The implications interdependence for policy makers in governments, and international firms and institutions are that recovery from the Great Recession involves paradoxes that can only be resolved by co-operation. Individual countries need to compromise their own selfish interests to some extent (and reach agreement) if they are to recover. In game theory terminology there is no (Nash equilibrium) recovery strategy which does not involve surplus (export led growth with X > M) countries reducing their surplus so that deficit countries (X < M) can reduce their deficits and increase their demand. Surplus countries need to spend more and save less: deficit countries need to do the reverse. The Great Recession has revealed the extent to which interdependence requires countries to have balanced growth; not allowing some sectors to become too big; instead developing balanced economies with industrial activity spread over many sectors, in manufacturing, services, (and in Russia for example in addition to dependence on natural resources); not relying as in China on exports alone (made over competitive by an undervalued currency); not relying as in the USA on big inflows of international capital (to fund high consumption and trade deficits). The tired ideas of MBA programmes ignore interdependence. They emphasise competitive advantage, identify of value with shareholder value, when organizations create (or destroy) value for their entire stakeholder group (customers, employees, the community, creditors, partners including suppliers and competitors), (c) efficient markets, (d) rational decisions. Independence is an underlying: unstated is the invisible hand assumption that if everyone (firms, individuals, nations) follows their own self interest then the welfare of the whole will be somehow maximised: but individual actions interact with one another, creating positive and negative externalities and feedback (blowbacks) over time. Blowbacks or positive feedback refer to interdependence over time. A new phase of globalisation took off in the 1980’s as a result of positive feedback between finance, technology and globalisation and descended into the Great Recession for the same reason around 2007. A significant instance of blowback is the direct line between the attacks on 11 September 2001 and the events of 1979, when revolutionaries in Iran deposed the shah held Americans as hostages. Then the CIA, with presidential backing (President Carter) began clandestinely arming the Afghan freedom fighters to wage a proxy war against the Soviet Union. This involved the recruitment, arming and training of militants who would later use these resources to attack the USA. Bringing intelligence to business and consulting issues requires an interdisciplinary or multi disciplinary approach that recognizes the interconnections between different branches of knowledge. The physical and social sciences generally have important insights for business. Creativity and imagination is required as well as analytic approaches. Perhaps it is true that creativity cannot be taught; but it can be shown, on the hypothesis that everyone has innate creative capacities. Often creativity is spoken of as thinking outside the box. This is a useful way of describing things but not very accurate. Rather the creative process is one of extending the box, escaping from the boundaries of the box. One technique for showing how this can be done is as follows: try to see interdependence and inter connections between seemingly unrelated ideas or phenomena. Nan-in, a Japanese master during the Meiji era (1868-1912), received a university professor who came to learn about Zen. Nan-in served tea. He poured his visitor's cup full, and then kept on pouring. The professor watched the overflow until he no longer could restrain himself. "It’s too full: It’s too full. No more will go in!" "Like this cup," Nan-in said, "you are full of your own opinions and speculations. How can I teach you anything until you first empty your cup?" See recent publications by eminent scientists for example Stephen Hawking, The Grand Design and Richard Dawkins, The God Delusion. For a critique of the latter see Terry Eagleton, Reason, Faith and Revolution. Reproduced from Newman, M (2008), ‘The physics of networks’, Physics Today: 33-38. In the PIIIGS economies, Portugal, Ireland, Iceland, Greece an spain and perhaps Italy. See for example on financial crises, Haldane, Andrew G., (2009). “Rethinking the financial network.” Speech delivered at the Financial Student Association, Amsterdam April and “The $100 billion question.”Comments by Mr Andrew G Haldane, Executive Director, Financial Stability, Bank of England, at the Institute of Regulation & Risk, Hong Kong, 30 March 2010. The example comes from Wikipedia. There are many others.